On 14th September, 1994, a UFO streaked across the sky over Southern Africa. Two days later, something landed in a schoolyard in Ruwa, Zimbabwe, with three or four things beside it, according to journalist Cynthia Hind. This was witnessed by 62 schoolchildren, who had little or no exposure to TV or popular press accounts of UFOs. Cynthia Hind interviewed them the day after the encounter and made them draw pictures of what they had seen. The case has since gone on to become something of a classic. The Harvard psychiatrist and UFO abductionist Dr. John Mack (1929-2004) came to Zimbabwe two months after the incident, and spent two days at the school interviewing the children, and the school staff. Interestingly, according to Headmaster Colin Mackie, while there were about 250 children playing outside at the time, only 62 claim to have seen it. However, not all 62 children were interviewed by Hind or Mack. The object that streaked across sky the sky of southern Africa two days earlier has since been identified: it was the re-entry of the rocket that launched the Cosmos 2290 satellite. And it generated a great deal of UFO excitement. 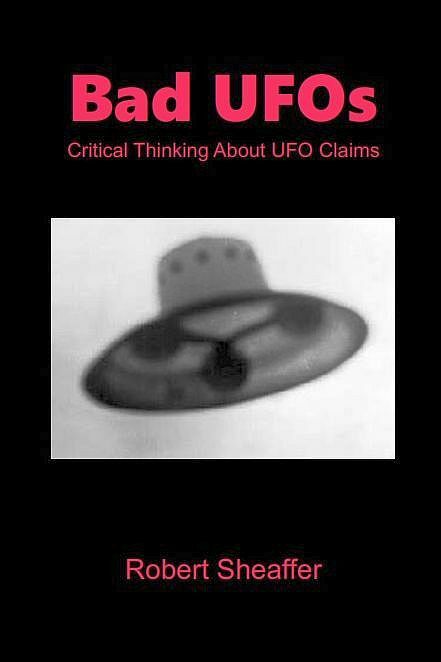 Cynthia Hind, who was editor of the journal UFO Afrinews, wrote fourteen pages about sightings from that incident. 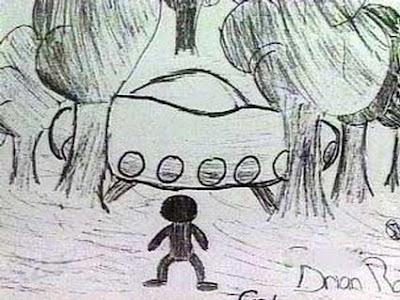 One of the childrens' drawings of what they supposedly saw. The boy is coaxed to imagine a rationale, then transpose it into the real world in the next question. A manipulation that is hidden by the editing of short sequences in the video. John Mack is caught red-handed encouraging the child to confabulate, integrate imagination into reality. JM knew that there was no verbal communication, so why did he suggested so heavily a different type of communication? What else than telepathy could it have been? The children did not make up the telepathic message, JM did. It became a "compelling" element of the story, fully validated by the famous Harvard psychiatrist. Fernandez' article is in French, but Google provides a readable translation of it. He writes, "it is particularly interesting (and telling) to see how the protection and ecology of the planet "appears" in the testimonies of the children when Mack questioned, while this theme was not present in the narratives collected by Cynthia Hind." This strongly suggests that Mack was "leading" the children to create narratives matching Mack's own beliefs and concerns. Also, Cynthia Hind conducting the interview is constantly interrupting the children and not allowing the free narrative. We must also wonder if the fact that the interviews as drawings sessions were held in the school, this did not lead them precisely, encouraged or "biased" them to make what would be compilations of stories ... kinds of school events, where, for example, the child thinks he must absolutely answer questions, produce a drawing, the adult (or authority here) will be waiting for answers and therefore it happens. She spoke on "E.T. Contacts and the Ariel School Incident." Her talk was highly emotional. She was crying as she spoke of encountering ETs floating above the ground. She said that she fell to her knees before one such being, whose face kept changing between that of an alien, and that of a lion. She has also had a conversation with a magic butterfly. The audience liked Ms. Trim's talk so much that they gave her a standing ovation. Fernandez notes that Ms. Trim was only in Third Grade at the time of the incident. Thus she was among the youngest in the school at that time, and she is never quoted by Cynthia Hind or John Mack.